Freshkills Park will be the largest park developed in New York City in over a century. The transformation of what was the world’s largest landfill into a sustainable park makes the project a symbol of renewal and an expression of how we can re-imagine reclaimed landscapes. Landfill infrastructure is essential to the Park’s design, and it adds to the project’s complexity. The park’s design, engineering, and ecological restoration emphasize environmental sustainability and public concern for human impact. The Fresh Kills Landfill stopped accepting household garbage in 2001. By then, DSNY had already installed systems for containing and collecting landfill byproducts and started closing sections of the landfill. 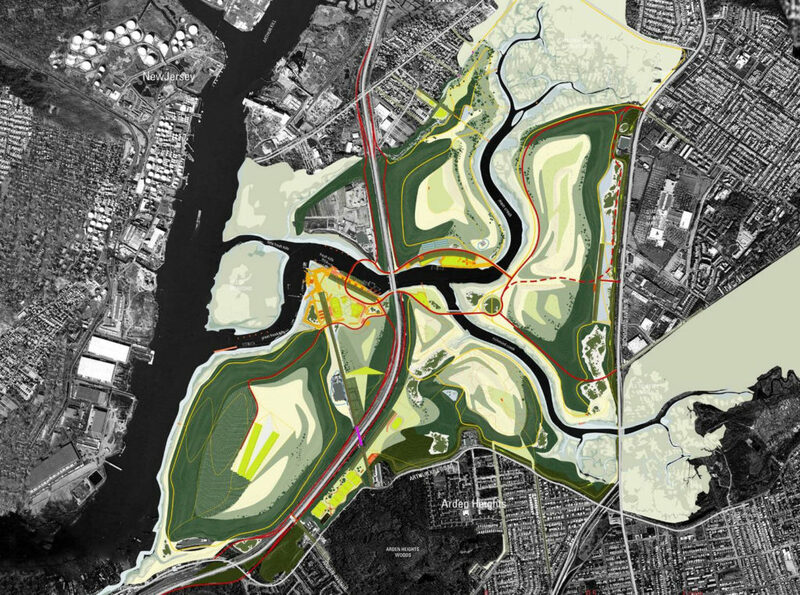 With the decision to shut down Fresh Kills, the Municipal Art Society (MAS) collaborated with the City of New York to sponsor an international design competition, run by the Department of City Planning. The process resulted in an illustrative park plan, known as the Draft Master Plan, designed by landscape architecture firm Field Operations. The basic framework of the plan integrates 2,200 acres of open grasslands, waterways and engineered structures into one cohesive and dynamic unit. Freshkills Park will host a variety of public spaces and facilities for social, cultural and physical activity, learning and play. The site is large enough to support many activities and programs, including nature hikes, kayaking, and large scale public art, among many others. As the park is built in phases, a calendar of free tours and events provides early access for learning and exploration opportunities. Primary program streams include a scientific research program, an art program, education for students, and recreation such as hiking, birdwatching, bicycling, running, and kayak tours. Freshkills Park contains productive habitats with a diverse array of wildlife. As a reclaimed landscape in a heavily urban region, the site holds great potential for providing habitat needs to vulnerable species. Since landfill closure, a variety of plants and animals have been thriving. Native grasses were planted on the capped landfill mounds, and rare grassland birds now make their home in what has become the largest grassland habitat in the region. Freshkills Park presents unique opportunities to study the processes of biodiversity changes in an urban setting, and to adaptively manage the reclaimed landscape to encourage species productivity. The Freshkills Park landscape has many natural features, but it is highly engineered. The landfill is maintained by the Department of Sanitation (DSNY) and overseen by the New York State Department of Environmental Conservation (DEC). The landfill mounds are sealed with a cap, which includes layers of soil and geotextiles. A system of wells, trenches, and pipes collects landfill byproducts underground and sends them to nearby treatment plants. Air, surface water and groundwater monitoring are conducted on a regular basis. To learn more, visit the Landfill Engineering page. Freshkills is defined by four landfill mounds, with tidal creeks running through the center of the landscape. An expansive network of paths, recreational waterways, and enhanced access through a system of park drives will help create an animated, interconnected park. Future plans include a publicly accessible road system that will create a connection between the West Shore Expressway (Route 440) and Richmond Avenue and provide access to the different areas of the park. In 2006, NYC Parks assumed responsibility for implementing the project, using the Draft Master Plan as a conceptual guide. Visit NYC Parks’ Planning and Building Parks page to learn more about the agency’s overall planning and building process. Schmul Park in the Travis neighborhood was redesigned in 2012. Owl Hollow Soccer Fields in Arden Heights opened in 2013. The New Springville Greenway near the Staten Island Mall opened in 2015. Construction is currently underway for phase one of North Park. The South Park Anchor Park project is currently in design, with plans for multipurpose fields and trails adjacent to Owl Hollow. As more sections of the park open, the unusual combination of natural and engineered beauty – including creeks, wetlands, expansive meadows and spectacular vistas of the New York City region – will be accessible. See Design and Construction Updates for more information.